You do not need to be a teenage mutant ninja turtle to love pizza – this is one food that we can all say, is more or less universally accepted thanks to the deliciousness of the product, not to mention being able to put just about any toppings on it – it is time to get creative in the kitchen with the oven! Well, here is one slice of pizza that you should not sink your teeth into, simply because it is not meant to be eaten – and it tastes bad, too. 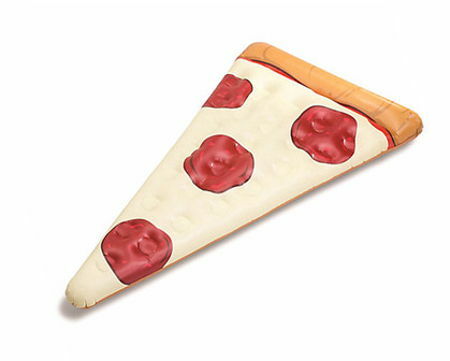 I am referring to the $34.49 Slice of Pizza Pool Raft that is definitely the cheesiest of pool floats around. It measures 5 feet long and is made from extra thick durable vinyl.